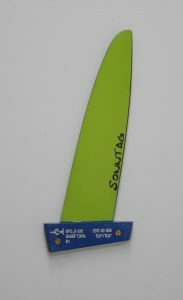 We are happy to announce that our latest symmetrical speed fin, named GPS_6, is ready for series production. 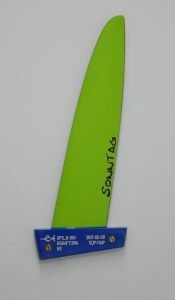 This fin was developed together with Peter de Wit. Testing was mainly done by Peter d.W. and Twan Verseput. 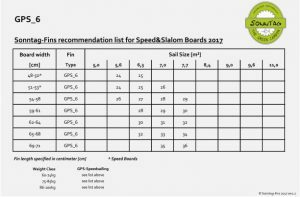 Please find here our fin length recommendation list to chose the right size depending on board & sail sizes. 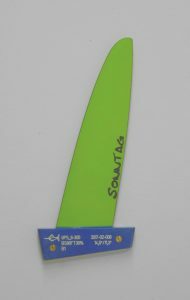 The aim of the GPS_6 was to create a true symmetrical speed fin for enthusiastic speed sailors adding some km/h extra-speed compared to what high end slalom fins can do. A key design goal was a fin characteristic of high efficiency, i.e. to apply sufficient pressure to the fin without causing high drag by the fin. The total surface area per length was reduced to decrease the drag caused by the friction of surface and water flow. Outcome is a high aspect design with a good balance of surface area over the fin length. We designed a special section by massive usage of CFD simulation software that allows to boost the speed when passing 55km/h and to translate the sail power to the fin without reaching a point of “speed-saturation”. This section allows seamless acceleration to a higher speed level by every gust you are able to catch. On all courses the board position is neutral, very stable and the fin behavior safe and predictable. This allows the sailor to fully concentrate onto the wind and water conditions making high level speed runs easier and is also increasing the total number of good runs for higher 5x10s average speeds. For the different board&sail brands and sizes, the different sailing conditions (wind&water) and different riders we got 2-6km/h better top and average speeds compared to different high end slalom fins (including our SL-X). As less chop and as more downwind as higher the difference in speed. In the jibe the GPS_6 is stable and predictable, but of course a slalom fin with its softer mid2tip section and more overall area can be jibed easier and is having a better acceleration after shifting the sail. For speed sailing we recommend to chose a 1-3cm smaller GPS_6 than you are used to sail with a slalom fin. So i.e. for the classical medium slalom board (68-71cm wide) with 7.0-7.8m² we recommend a 35-36cm GPS_6 when sailing in light chop or flat water conditions. If doing off-shore speed sailing and flying over/through 1-2m swell you need to go for 1-2cm longer GPS_6 than in the light chop conditions mentioned before. For the boards tested we were able to shift the mast foot a bit backwards still sailing the boom at a high position without negative effects on board control. This is giving you better speeds by less wet surface area. For the start of series production we can offer GPS_6 in the length range of 24-36cm.